Snake Plant or Mother in Law's Tongue is a simple, elegant houseplant that is extremely low maintenance. These plants can withstand droughts and fluorescent light without a second thought. There are several different colors and varieties, so there's a snake plant that appeals to everyone. 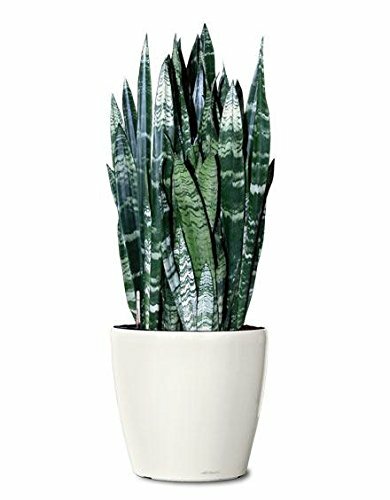 Snake plants are excellent in corners or areas with limited space requirements, as they are nearly vertical with little to no horizontal branches or growth. New plants appear from roots that are sent underground and appear as new sprouts in the same pot as the original. These beloved plants are known for their sharp architectural shape, and have the added benefit of cleaning air indoors. Snake Plants are known to remove benzene, formaldehyde, trichloroethylene, xylene and toluene from the air inside homes. Mature Height: 10" - 16"
Mature Width: 10" - 18"
If you have any questions about this product by Garden Goods Direct, contact us by completing and submitting the form below. If you are looking for a specif part number, please include it with your message.